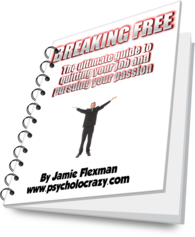 I have created this ebook to hopefully inspire and help you with eventually breaking free from the shackles of everyday life and to pursue whatever passions and dreams that you wish to follow. Page 18 – Do you have the courage ? To gain access to this free eBook simply enter your email address in the form below. IMPORTANT – You will receive an email asking to confirm your subscription, so just click the link contained in the email and you’re all done!